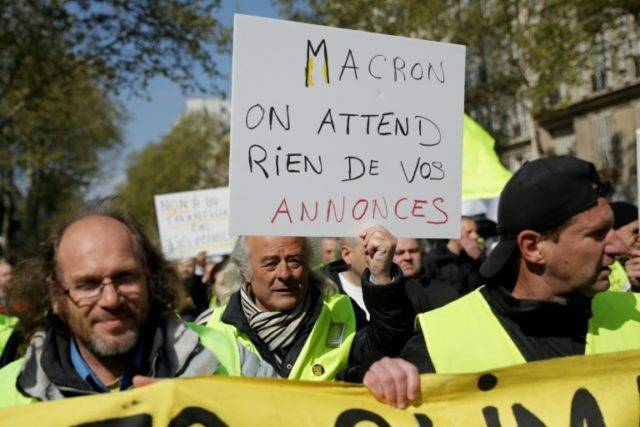 Paris (AFP) – French President Emmanuel Macron will go on television on Monday evening to announce a series of policy changes based on the feedback received over two months of public consultations triggered by the “yellow vest” revolt. Macron will give a televised speech at 1800 GMT setting out the “first concrete measures” to be taken in response to the “concerns raised” at over 10,000 debates held around the country as well as the nearly two million contributions made online, the presidency told AFP. Two days later he will give a press conference to discuss his policy adjustments, the presidency added — a rare move by a leader who has avoided press conferences since his election in 2017, apart from when receiving foreign leaders. Macron launched his “Grand National Debate” on January 15 to try end the biggest crisis of his presidency. The protests have regularly ended in rioting and destruction of property, with some of the worst violence seeing the Arc de Triomphe war memorial in Paris sacked on December 1 and several businesses on the famed Champs-Elysees avenue looted on two separate occasions. “He won’t get a second chance,” Senate leader Gerard Larcher, a member of the opposition Republicans, warned in an interview with Le Figaro newspaper on Saturday.